Pressure cookers definitely act as one of the best means in which food can be cooked when in a hurry. In fact this utensil is not something new that has been incorporated in the list of cookware in the recent times. It has been years since the first pressure cooker was invented. Keeping in mind the technological advancements in the present times, there has been a large scale hike in the varieties of cookers. 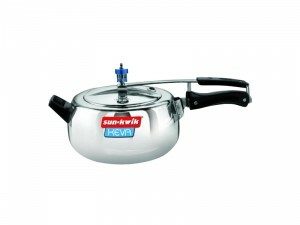 Companies like Sunkwik make it a point to provide their clients with everything ranging from an induction pressure cooker all the way to the simplified electric ones. Among various things that have added on to the growing popularity of these products one of the most vital points that need to be noted is that the present range of cookers help save a lot of time as well as energy while cooking. Moreover gone are the days when utensils of this sort created a major whole in the pocket of the purchaser. How Much Reliable Are The Heat Proof Containers For Your Foods? How To Cook Healthy With Non-Stick Pressure Cooker? Often there lies confusion as whether non-stick cookers are good to perform healthy cooking? Or it is correct to abandon the product citing the presence of some toxic chemicals getting contemplated with the cooked food. The new age cookware available on the marketplace underwent a gradual technological change. In tune to the stylish the cookware looked, cooking on these pots has to be quick as well as healthy. Health has been a major thinking segment both to the buyer as well to the owners. Back in the 1940’s some non-stick pressure cookers were chemically tested to preserve the amount of Teflon, extremely hazardous for human health.